One of the jobs and (occasionally) joys of thinking philosophically is to recognize the things that are overlooked; it is to recognize the forgotten; to highlight the “obvious”. Indeed this is true when considering the nature of our communication. We are a speaking species, and we use a most unique method to communicate with one another: words. No other species we know of uses words as an essential component of their interaction and being. We begin using words as quickly as our parents can make us, and it’s truly a necessary means of adjoining one mind to another and ultimately of forming society. Every sentient species, or most at least, can communicate with others in some way. They use vocalizations, gestures, or some other means specific to their nature. For humans, our use of words are actually a use of signs: things that point to other things or realities. Indeed, they are a special class of signs that we created and may be thought of as conventional (as opposed to natural); language is natural, but the specific words that inhere are formed by us. As St. Augustine describes in his work On Christian Doctrine, words are used for “drawing forth and conveying into another’s mind what the giver of the sign has in his own mind” (Book II, Ch. 2). For instance, when one uses the word “horse” in conversing with another they are using that sign to point to the animal John Wayne rides on the Silver Screen. Words, in a similar way to thoughts, are intentional, and aim at some other thing. As is evident, there are two modes of communicating via words, that being speaking and writing. Speech is of course when one vocalizes words normally to be heard by another, a hearer. The spoken word is one that comes in and out being rather swiftly, unless we have utilized some technology to record the moment. The written word is precisely the original technological innovation to do just that; however because it lacks the presence of the speaker and the auxiliary conveyance inherent in personal interaction it can be a more complex phenomenon. As it often transcends the paradigm in which it was etched, and can be read long after the author is gone, it adds further dimensions of concern for a reader. Beyond just knowing the language, the reader must deal with translations, foreign allusions, historical circumstances that illuminate meaning and the like. But the purpose in using speech and the written word are the same: to allow the hearer or reader to grasp the meaning of the speaker or writer. One has to recognize the word-sign, and that directs him to the object or reality being addressed; in other words, there are two components that the hearer or reader must get in order to get the meaning of a statement: the sign and the thing-pointed-to. We can say there has been a successful communication when the receiver has recognized both. To utilize our example above, if someone says the word “horse”, in order to understand them we must know that “horse” is a sign that points to the four legged, long haired, apple-eating, seemingly complaisant man-carrier. Because this is where the crux lies, if there is a mistake in either case the hearer or reader will suffer ignorance. For instance, if when the speaker uses the word “horse”, and the hearer recognizes the sign but has a quite insufficient knowledge of the thing-pointed-to, he will adopt or employ a false view. If his knowledge of horses is only gleaned from the Hollywood, he might arrive at the conclusion that horses are eagerly disposed from birth to be saddled and directed by man. But this, of course, is only achieved with great effort and time, with a taming of their nature. Under normal circumstances, his concept of a horse can be corrected by some equine expert or investigated via regular avenues of human reason. Also his ignorance probably doesn’t have much bearing on his livelihood. With these thoughts in mind, how does it impact our thinking about something that purportedly does have great impact on one’s livelihood? Sacred Scripture is recognized by Christians to be the inspired testimony of the Incarnation and full of the teachings of Christ and His Apostles; if that’s true, one’s understanding of Scripture might make an eternal difference. It is also claimed to be inerrant in its revealed truth concerning the Faith. Knowing what it means would seem to be of the utmost import. Obviously it is composed of words, which means that if the above analysis is correct, there are at least two things the reader must recognize to come to an understanding. They must recognize the word itself, and the object it points to. They must interpret the signs on the page, and call to mind the realities or things pointed to. How can one know if they are interpreting the sign correctly, calling to mind to right thing-pointed-to, and if they understand the nature of the thing-pointed-to? Who has the authority to correct one’s interpretation, or one’s understanding? For an individual to be the authority of determining the meaning, he will inevitably suffer from subjectivism, and tends towards solipsism. In this case, the individual who believes that horses are not born wild and untrained but domesticated has the authority to overrule reality. If he has the authority to think whatever he wants about the sign and the thing-pointed-to, he seems to be inconsonant with the demands of objective truth. He is wrong, but he “makes” himself right. The nature of something that is true objectively is that in order for one to recognize it, they must conform their minds to it, not vice-versa. Further, if two individuals read the same text and form two contradictory notions, they cannot both be right. The principle of non-contradiction, which underlies not only our minds but all of reality, would be overridden. This literally means the end of truth itself. What about the situation with the imperfect understanding of a horse? We said an individual could perfect their concept via rational investigation to overcome their ignorance. Why not here in the case of Sacred Scripture? The difference lies in the fact that knowledge of horses is inherently something that can be discovered via human reason, while the objects of faith are beyond our rational penetration. The whole point of revealed truth is that we cannot come to know it on our own. We also said above that the equine-challenged person could consult an equine expert to correct his knowledge. Is this appeal to experts possible in the realm of understanding Scripture? There are certainly many who are educated in the necessary fields to read Sacred Scripture well. They have mastered the ancient languages, and other disciplines required to read the texts how they were intended by the author. There is not doubt these skills are very helpful, and ultimately necessary to achieve understanding. As most will agree, the historical-critical method of Scriptural scholarship has yielded great return on better understanding the historical paradigm and intricacies therein. However, it is also true that no amount of education can overcome the limitations of the individual; hard as we try, we cannot become omniscient nor experts beyond a fault. Scholars are notoriously divided on essentially every issue they undertake to in study in history, philosophy, and even the physical sciences. The authority they would exercise in the matter would at root be tainted by the same problems as the above case. They would perhaps trip over higher-level issues, but trip they would (and do). In other words, while the expert has a good shot of recognizing the word-signs correctly in Sacred Scripture, they cannot be guaranteed of recognizing the thing-pointed-to. What about a group of individuals? Can “strength in numbers” provide a basis of how to understand the meaning of Sacred Scripture? We know that individuals, whether learned or not, are not in the position of determining the meaning because they inevitably impose their own limitations on its meaning. But perhaps a group or majority of people can correct the problems one might have on their own? This seems to be a better option, because it does cohere with how we treat other disciplines. Science, history, philosophy, mathematics and others have their way of referring to their community in order to justify results, and that can head off implicit blunder or even aid in critical breakthroughs. However, if we notice, we have already undercut this option. While the democratic principle is useful to recognize how most people think, or even to correct errors in certain cases, it is in principle incapable of being a criterion for truth. If the majority believes something, that doesn’t make it true. We can list countless examples of the predominance of a given idea that was later proved to be false, or can be logically shown to be so. If sixty percent of Americans believe that two and two equal three, that doesn’t make it so; even if they think it is four, that doesn’t make it so. If these options for safeguarding one’s interpretation from error are lacking, is there an entity that is capable of doing so? Is there a mechanism or authority that doesn’t suffer the limitations of the individual or groups of individuals? It would have to be something that is specially formed or accredited to avoid error in interpreting the meaning of Scripture. If there is objective truth to be had there, it seems the answer is yes. If the Church is what she purports to be, then that is obviously the suitable authority. She has the capability to adjudicate between disputes about the word-signs and the object or realities pointed to. This doesn’t imply that the mysteries of the Faith will be resolved or explained away, but precisely that they won’t. Nor does it imply the Church is right about everything, but only about the content of the Faith and deductions from it. Many Christians will agree with this, though there may by some disagreement about the nature of the Church. That is a discussion for another post, perhaps. So far I’ve tried to suggest that it is in the nature of words to require a hearer or reader to interpret them in order to comprehend them; that they are signs that require one to recognize both the sign itself and that which it points to. In order to come to an understanding when dealing with words, one must be correct on both counts. In normal cases, this requirement can be met by abilities to gain knowledge and perfect our concepts through experience and reasoning. However, it is precisely not possible in the case of Revelation because it is in principle beyond our reason; it can be explored by reason but not attained by it. This means there must be some kind of authority in order to correct our interpretations if they are wrong or are lacking. It cannot be individuals, scholars, or majorities because all appear lacking in their competency. In the end, it seems the only way to safeguard the objective truth contained within Scripture is if there is some entity specially equipped to correct us. This entity seems to be the Church. Some months ago I wrote a series of posts critiquing the Reformed doctrine of total depravity. As a result, I was promptly accused, by some readers, of being a Pelagian. It was then that I realized that I had made a rather notable mistake: I had failed to expound upon what I believed with regards to sin, the human condition, and man’s salvation. Having failed to explain what I believe, some readers misunderstood my critiques of total depravity and jumped to some rather extreme conclusions about my theology. In consequence, I have decided to write this post in an effort to further clarify my position. This essay reflects, however poorly, what I believe about the depravity of man, the nature of sin and evil, and, in an extremely limited way, salvation. I will not discuss, in any detail, my theory of the atonement, justification, or sanctification; rather, I will simply emphasize man’s utter dependence upon God for life and his unavoidable dependency upon God’s grace and mercy to be saved. Please note that St. Augustine is speaking of the good in an ontological sense and not in an ethical sense. Also note that, for him, evil does not have a substantial existence, in and of itself, but only exists in the form of a degradation of or corruption of something which is substantial good. Thus, when I say that human beings are by nature good I’m not claiming that they are without sin (i.e. ethically good) but that they are made in the image and likeness of God and, hence, in the image of Goodness and Perfection Himself. Therefore, no matter how much sin twists and degrades us, we never stop being human–for if the image of God was completely eradicated the good which sustains our being would have been destroyed and we would cease to exist. “There they [those who have rejected God] are, in great terror, in terror such as has not been! For God will scatter the bones of the ungodly; they will be put to shame, for God has rejected them” (Psalm 53: 5). Having rejected God in their hearts (which is clearly an act of the will) mans behavior becomes corrupt and he chooses to live an unethical life. His sinful choices, as the Psalmist makes clear, lead to his dissolution and destruction. This point is also made by St. Paul in no uncertain terms, who proclaimed that: “the wages of sin is death” (Romans 6:23). Therefore, from a Biblical perspective, the depravity of man is an ethical problem with profound ontological consequences (1). Furthermore, according to Psalm 53, this ethical problem is pervasive and universal; that is to say, every human being chooses, of his own free will, to turn away from God in order to serve his own self-interest; to worship the Creation rather than the Creator (this idea is more fully developed by St. Paul in Romans 1). 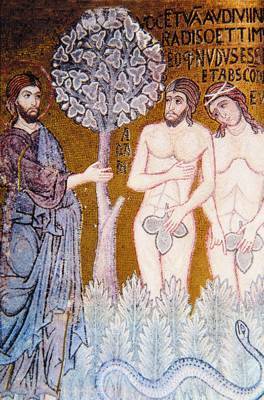 So, although man is by nature good, being made in the image of God, he suffers from the consequences of Adam’s sin: namely, he is born outside the garden and, hence, estranged from God, he is subject to physical corruption and bodily death, he is tempted and manipulated by evil spirits, and constantly suffering from and profoundly affected by the sinful choices of others. Consequentially, this Fallen environment, this twisted and broken world system, drives man to make unethical choices and so, he also suffers from the consequences of his own personal sin. “and you he made alive, when you were dead through the trespasses and sins in which you once walked, following the course of this world, following the prince of the power of the air, the spirt that is now at work in the sons of disobedience. Among these we all once lived in the passions of our flesh, following the desires of the body and mind, and so we were by nature children of wrath, like the rest of mankind. But God, who is rich in mercy, out of the great love with which he loved us, even when we were dead through our trespasses, made us alive together with Christ (by grace you have been saved), and raised us up with him, and made us sit with him in the heavenly places in Christ Jesus . . . for by grace you have been saved through faith; and this is not your own doing, it is the gift of God” (Ephesians 2:1-8). In summary, man is by nature good, being made in the image of God; thus, he is not totally depraved. However, man is born into a broken and corrupted world, subject to the consequences of Adam’s sin, influenced by the sins of his forefathers and by the, “prince of the power of the air,” and, hence, he inevitably chooses to sin (i.e. to act in a manner which is contrary to his own nature). In this way, in an ethical sense, man is radically depraved. Trapped in a dying world and being guilty of personal sin, man is unable to do anything, on his own, to save himself. He needs Jesus to pull him out of the mire, to give him life, and to fully restore the image and likeness of God which has been soiled by his sin and the sin of others. (1) On this point, it should be noted, Reformed theology teaches the exact opposite of what we have just outlined; namely, it teaches that man has a serious ontological problem (being totally depraved or having a sin nature) with profound ethical consequences. This notion, aside from being unbiblical, is also incoherent (see my previous writings on total depravity). (2) This statement does not negate man’s responsibility or choice in the matter; nor does it deny he has free will. Man must chose to participate in God’s work to save and restore Creation, he must chose to believe in Jesus; nevertheless, salvation is the work of God in man. My goal for this year, or for at least the first half of the year, is to develop more on the theory that a belief in the Trinity is the foundation of a proper spiritual life. For whatever reason (possibly due to Peter Lombard and scholasticism), the doctrine of the Trinity has been treated as something for the intellects. After all, when was the last time you heard a sermon on the Trinity, not just how we describe this aspect of God, but how the Trinity is central to a proper spiritual life? What bothers me is how often I hear the innumerable analogies shelled out to describe the Trinity (I myself have been guilty of such analogies). There are some who say, “Well, I am a father, brother, and son, but still one person,” but this analogy fails because it describes the heresy of modalism, or that the Father, Son, and Holy Spirit are simply roles instead of distinct persons. Others try to say, “Well, I am body, soul, and spirit, just like God is Father, Son, and Spirit,” (which, we are not tripartite beings; we are only two substances, material and immaterial, so the analogy fails from the get-go), but this too is a heresy. It teaches that Father, Son, and Spirit are substances of God and not persons of God. No matter how we cut it, any analogy we use will only analogize a heretical view of God, but will never come close to describing what the Trinity is like. One of the most difficult thing for Westerners to understand is that there is nothing in all of creation that is analogous to God’s essence. The Trinity is truly unique, but He still provides a lesson for us in His nature. Though He is one in essence, He is three in persons, thus God is truly a “He/They” which is a mystery. Being a mystery, however, does not exclude this doctrine from being essential to the Christian life. I hope to show that our misunderstanding of the Trinity in the modern era is most likely what lies at the root of our problems as a Church. If we were to truly understand the Trinity and the role of the Incarnation in our relationship to the Trinity and then act upon such knowledge, then I believe many problems within the Church would disappear. I believe that it is not only necessary to embrace the Trinity (even in a most primitive teaching) in order to have salvation, I believe one cannot properly live as a Christian without accepting the doctrine of the Trinity. To ensure I follow through on this resolution, I am currently reading Augustines De Trinitate (“The Trinity”) where he proposes the theory that the Trinity is central to all Christian doctrine; without the Trinity, Christianity begins to fall apart. My hope is that later this year I can post a paper discussing what I have discovered and the conclusions I have come to.